Flipkart Big Shopping Days Sale 2018 is a sale which will begin at 4pm IST on July 16, and go on till July 19. As we all remember the Big Billion Days by Flipkart, this year they have come up with the sale called Big Shopping days. Flipkart is one of the India’s largest and the leading e-commerce site which is headquartered in Bangalore, India. It was founded by the ex-employees of Amazon India specifically Bansal brothers i.e. Sachin Bansal and Binny Bansal. How to contact Flipkart Customer Care Support? 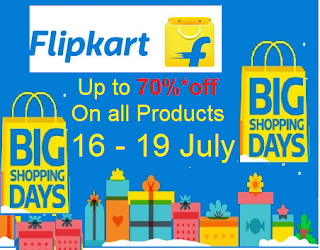 In this Flipkart Big Shopping Days Sale 2018 the customers will get biggest deals and offers on wide range of categories of products like Mobile Phones, Laptops, House-hold appliances, Baby care products, Beauty care products, Men’s Apparel, Women’s clothing, Foot wear and many more. Coming to the most awaited section i.e. offers on Apple devices especially iPhones, Apple Watch Series 3, iPhone X, iPad 6th gen and many more. If you are facing any problem while buying the products on Flipkart Big Shopping Days, you can contact Flipkart Customer Care Support. Please feel free to post your complaint/query/problem/doubt in the below comment box. Must Read: How to contact Flipkart Customer Care Support?